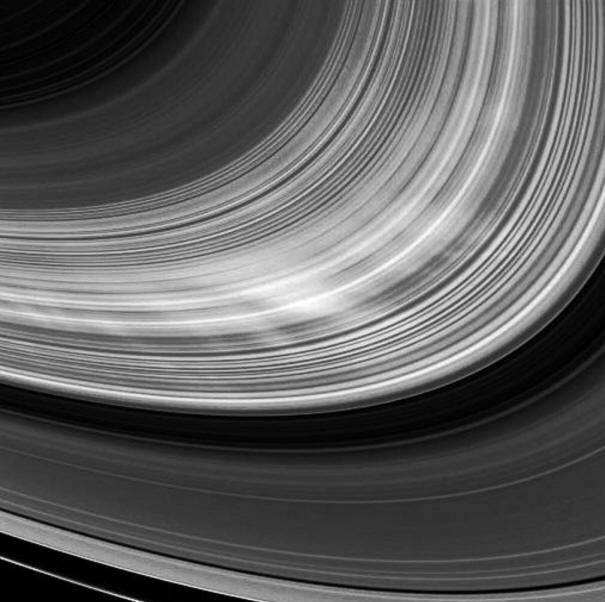 Bright spokes across Saturn's B ring. Credit: NASA/JPL/Space Science Institute (01/29/09). Spokes have not been seen in Saturn's rings for years. What caused them to return? Radial shadows extending across Saturn's ring plane, called "spokes," were first detected by the twin Voyager spacecraft as they flew past the giant planet in November 1980 and then in August 1981. However, when Cassini-Huygens entered orbit around Saturn in July 2004, the spokes were gone. Five years later, the now renamed Cassini-Equinox high resolution imagers have seen the spokes again. Space scientists have been fortunate to live in these times. Since the launches of Voyagers 1 and 2, a twenty-two year solar cycle has run its course and another has begun. Saturn has completed an entire orbital revolution around the Sun, so the ring plane has oscillated up and down over that time because of its equatorial tilt. The Hubble Space Telescope has been reengineered and fitted with optics the likes of which were not even imagined when it was launched in 1990. Unprecedented images of the Saturnian system using its cameras, as well as other new telescopes, have confirmed the Electric Universe hypothesis time after time since those days ten and twenty years ago. 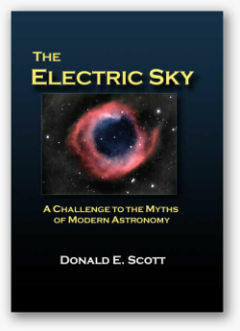 For example, between November 2007 and February 2008, scientists were monitoring the largest lightning storm ever seen in Saturn's turbulent atmosphere using Hubble and other ground-based telescopes: 3500 kilometers wide, with lighting discharges 1000 times more powerful than anything found on Earth. Recently, a group from the Austrian Academy of Sciences has discovered another lightning storm that is the longest lasting yet recorded, lasting almost eight months, so far. Using the Cassini-Equinox Radio and Plasma Wave Science instrument, Dr. Georg Fischer and his team discovered radio wave emissions from isolated locations in Saturn's lower latitudes called "Storm Alley." This may be a reemergence of the powerful "Dragon Storm" discussed in previous Picture of the Day articles. 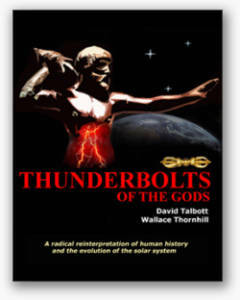 Could there be a connection between the solar cycles, Saturn's orbital position, the spokes, and the lightning discharges? 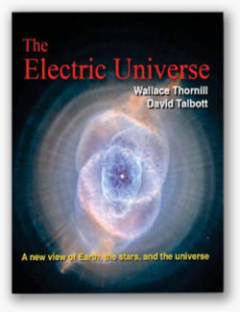 The Electric Universe theory provides a consistent explanation for most of the discoveries that planetary scientists confess are "puzzles" and "due to processes that are poorly understood." For example, the spokes are caused by radial discharges from Saturn's magnetosphere into its ionosphere across the ring plane. The rings are composed of large chunks of material, but they contain a high percentage of ultra-fine dust that is easily ionized. Dusty plasma tends to concentrate the discharges in the plane of the rings. The finely divided ring particles become oppositely charged and move out of and above the rings. What reason is there for Saturn's magnetospheric discharges then and now? In the 1980s, the Sun's electric activity, the solar sunspot cycle, was at its maximum. Today the solar cycle has just passed its minimum phase. It is known that the activity of solar maximum creates electrical effects on Earth: brighter auroras, disrupted power transmission, and satellite communication problems. Are the spokes of Saturn an expression of the sunspot cycle? Do they appear at solar maximum and minimum because that is when the magnetic polarity reverses on the Sun and Saturn is at a specific orientation? Further analysis of data from Cassini may provide answers to those questions. Saturn occasionally breaks out with a "great white spot" three times larger than Earth. From an Electric Universe perspective, intense electric discharges deep in Saturn's atmosphere cause vertical jets very similar to the sprites in Earth's upper atmosphere. Saturn's electrical connection to the current flow in the Solar System can explain most of the effects that Cassini and other science packages have discovered on and around Saturn.